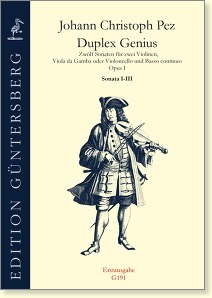 Pez’s sonata collection "Duplex Genius sive Gallo-Italus Instrumentorum Concentus" appeared in 1696. Contrary to the title’s promise, the sonatas clearly speak the musical language of the Italians, with which Pez had become acquainted in Rome. French elements clearly withdraw behind those of Corelli’s style. The level of difficulty is moderate. The third part can be played on a gamba or on a cello. The basso continuo can be played on a harpsichord or on another chordal instrument; an amplification by a further bass instrument is not necessary. Five of these sonatas have already been published in 1928 in a “Denkmäler” volume. 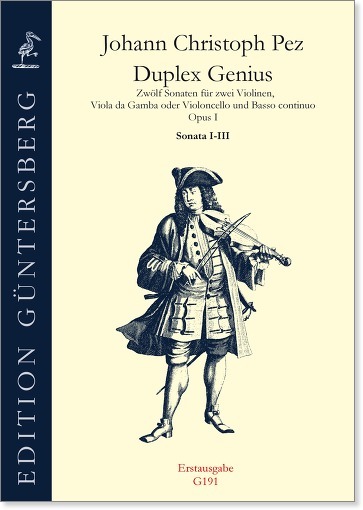 All twelfe sonatas are now presented by Johannes Weiss in a practical edition which satisfies today’s requirements for fidelity to the original.